"Mr. Scrooge!" said Bob; "I'll give you Mr. Scrooge, the Founder of the feast!" 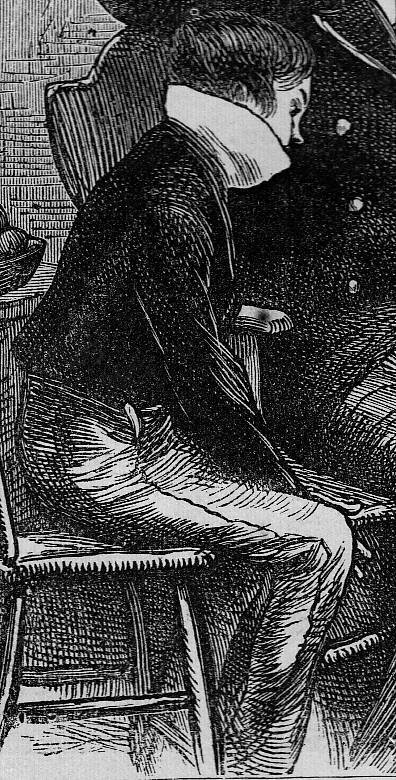 — fifth illustration by E. A. Abbey for Dickens's "Christmas Stories"
As Davis, notes, Dickens's denying Mrs. Cratchit even a Christian name does tend to relegate to the status of supporting character at best; certainly, she does not appear at all in Leech's original sequence or in Barnard's five woodcuts for the British Household edition, and is overshadowed by her outgoing, bustling husband in those series in which she does make an appearance: Abbey's (in which she sits well to the right-hand margin, presiding over the distaff side of the familial hearth) and Eytinge's (in which she welcomes home her husband, her back towards the viewer in "Bob Cratchit at Home" and is seen only in profile as she serves "The Wonderful Christmas Pudding". Even in the deathbed scene "Poor Tiny Tim!" she is curiously absent, as if even Tim's imagined death is gender-restricted as yet a final opportunity for male bonding. "A Merry Christmas to us all, my dears. God bless us." "Mr. Scrooge!" said Bob; "I'll give you Mr. Scrooge, the Founder of the Feast!" "The Founder of the Feast indeed!" cried Mrs Cratchit, reddening. "I wish I had him here. I'd give him a piece of my mind to feast upon, and I hope he'd have a good appetite for it." "My dear," said Bob, "the children. Christmas Day." "It should be Christmas Day, I am sure," said she, "on which one drinks the health of such an odious, stingy, hard, unfeeling man as Mr. Scrooge. You know he is, Robert. Nobody knows it better than you do, poor fellow." "My dear," was Bob's mild answer, "Christmas Day." 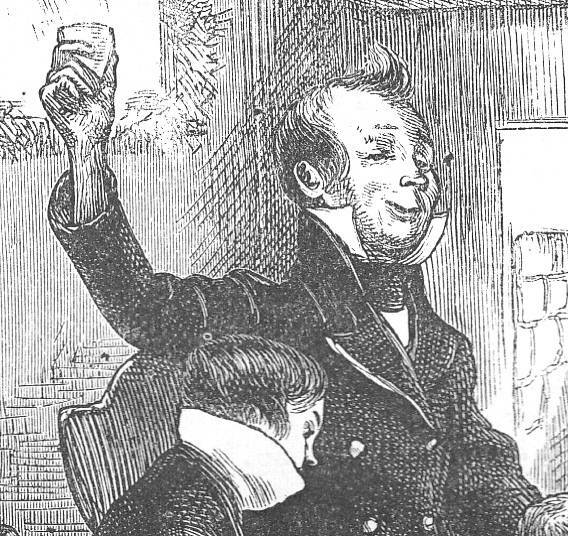 "I'll drink his health for your sake and the Day's," said Mrs. Cratchit, "not for his. Long life to him. A Merry Christmas and a Happy New Year! He'll be very merry and very happy, I have no doubt!" In fact, although this dialogue spills over onto the twenty-eighth page, Abbey has attempted to convey the perfect harmony and good will that prevades the Cratchit hearth prior to Bob's raising his tumbler. Mrs. Cratchit looks demurely at her her husband as he pronounces the toast, and does not remonstrate with her charitable spouse. With this identification, one can see in Abbey's illustration that the illustrator has placed Peter immediately to the right of the father, and Tim, under Bob's protective hand, to the father's left. 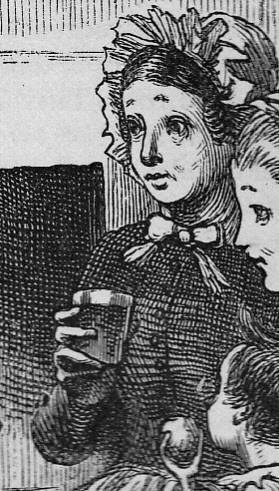 The little girl, sitting immediately before the fire, her back towards the viewer,would be the equivalent of Harriet Dickens. In the female-dominated right-hand register, Mrs. Cratchit (Dickens) is at the top of a parenthesis, and immediately below her are Belinda Cratchit, Martha Cratchit, and the unnamed Cratchit son who corresponds to Fred Dickens. The faces of the three Cratchit females bear a striking similarity in profile. The wreath above the fireplace is an interpolation implying a halo for this blessed family. Although we cognize Bob's checkered trousers from his initial appearance in Abbey's series, his double-breated jacket seems to grown longer and more stately than the short suit jacket he wears in the Cornhill sliding scene. 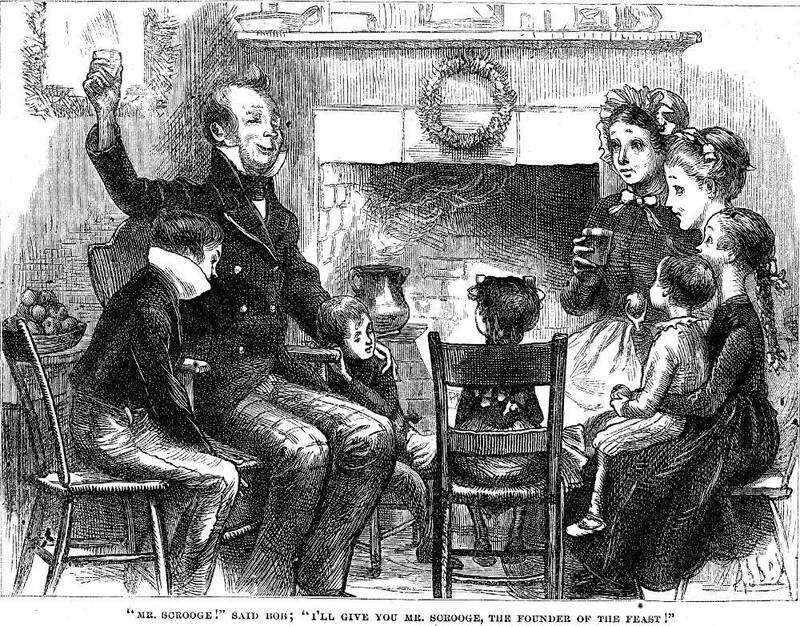 Even though the text is explicit about the entire family's drinking the toast ("The children drank the toast after her" 28), in order to avoid any suggestion that the Cratchit children are imbibing an alcoholic beverage, Abbey does not provide any of them with a tumbler: the youngest boy (right, on Belinda's lap) appears to be eating a small apple, and only the two adults have tumblers — presumably filled with the jug of steaming punch from the hearth, immediately above Tiny Tim's head. Guiliano, Edward, and Philip Collins, eds. A Christmas Carol. The Annotated Dickens. Vol. 1. New York: Clarkson N. Potter, 1986. ---. The Lives and Times of Ebenezer Scrooge. New Haven and London: Yale U. P., 1990. ---. Christmas Stories. Il. E. A. Abbey. The Household Edition. New York: Harper and Brothers, 1876. Hearn, Michael Patrick. The Annotated Christmas Carol, il. John Leech. New York: Avenel, 1976.